Why keep house plants around? They brighten up the room, and are as calming as they are decorative; not to mention fragrant, depending on the species. However, the best reason is that plants raise indoor air quality; naturally purifying what we breathe in through the process of photosynthesis. While most plants simply absorb carbon dioxide and release oxygen, some clean the air more than others; removing chemical traces left behind by cigarette smoke, cleaning products, manufacturing processes of typical household items, and more. It’s plants like these that you should keep in your bedroom. Not all air-purifying plants are non-toxic when ingested or handled, though—which is a problem if you have pets around! While you can keep plants out of reach by hanging them or putting them somewhere inaccessible, why go through all that trouble? An easier solution is simply to choose pet-friendly foliage. Below is a list of our five favorite non-toxic bedroom plants. We like this plant so much that we listed it twice! Not only is it one of the most effective air purifying plants listed in the NASA Clean Air Study, but it’s also non-toxic. Apart from keeping it indoors, you can also use the Bamboo Palm to decorate your patio or your porch. It can shoot up way past seven feet—although it is a slow grower—so there’s a lot of versatility when it comes to utilizing it in home design. The downside? It’s not low maintenance at all. 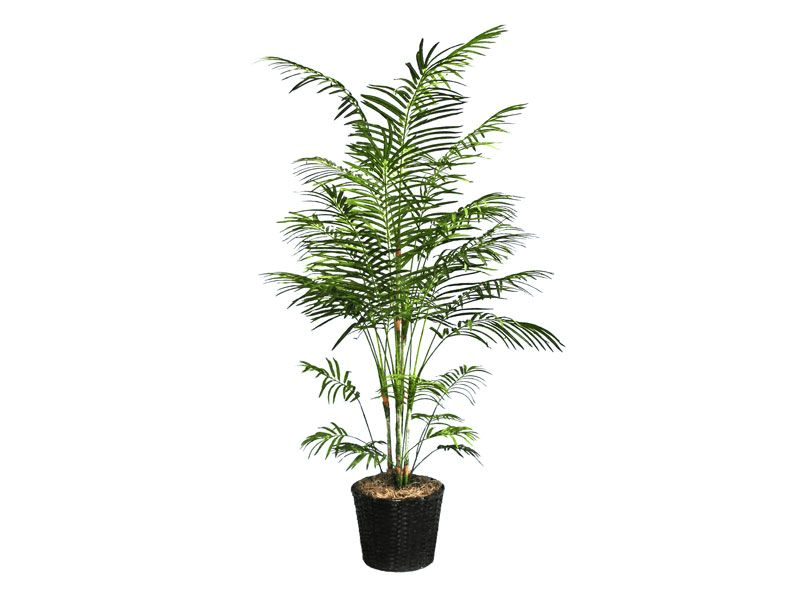 This tropical plant needs indirect or filtered sunlight; as well as regular watering and pruning. You may also need to re-pot it periodically. The Boston Fern is a hardy perennial plant native to the tropics, commonly found in the swamps and forests of Florida and Mexico; as well as parts of Central America, South America, Africa and the West Indies. Although it grows wild, it is also a popular house plant. The Boston Fern is usually kept in hanging baskets or potted and placed on a high shelf, with its fronds arching downward. 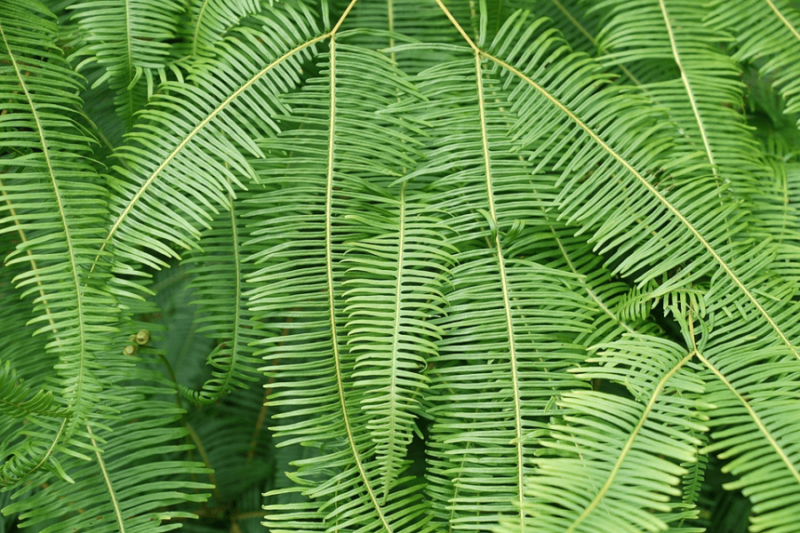 The fronds can grow from a little over a foot up to about eight feet in length! Maintenance is not hard: Just make sure that the soil is damp, mist the plant once in a while—especially when air humidity drops—and expose it to bright but filtered sunlight. Also worth noting: In South Africa, the Boston Fern is classified as an invasive alien plant, likely because of its similarity with the (truly invasive and exotic) Tuberous Sword Fern. Speaking of South Africa, here’s a perennial flowering species indigenous to the same area: the Barberton Daisy. A depiction of this plant appears in the coat of arms and the flag of the Province of Mpumalanga in eastern South Africa. The flowers are tall as they are colorful; the blooms can be orange, pink, red, white or yellow. 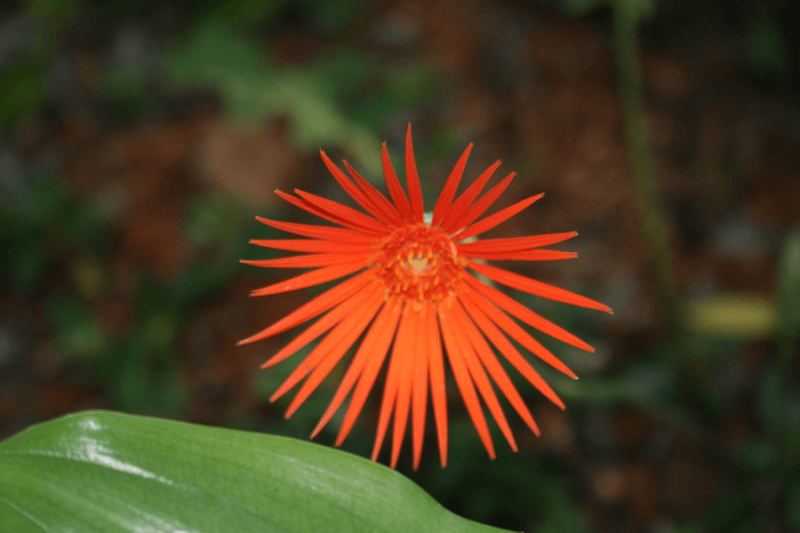 When grown indoors, the Barberton Daisy can flower during any season, and each flower can be expected to last for a month or more. While they are non-toxic and safe for pets, the converse is not always true. The Barberton Daisy’s leaves are paper-thin! It doesn’t take a lot to tear and damage them, so do keep the plant out of reach if you happen to have curious and active pets. Attractive and easy to maintain, they make for great potted decorative additions to your bedroom. 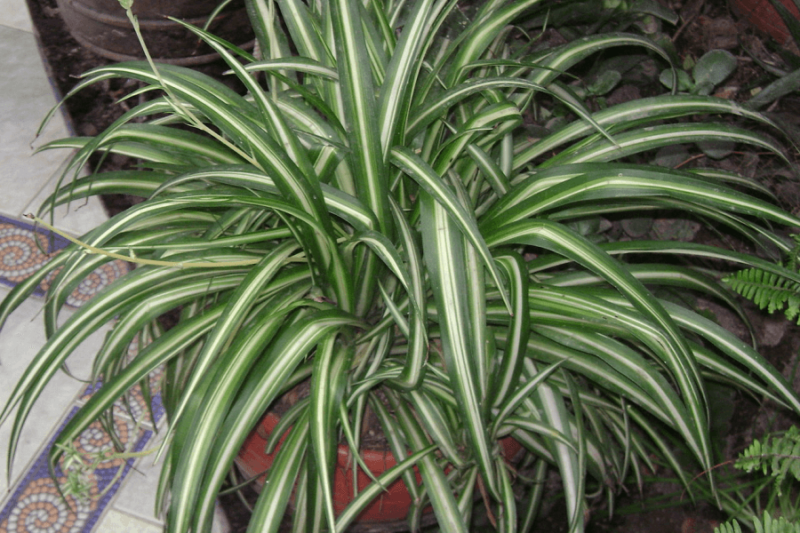 Another tropical plant native to South Africa is the Spider Plant. Like the Barberton Daisy, the Spider Plant is also perennial and flowering—as well as a popular mid-sized potted houseplant known for its air-purifying properties. Unlike the Barberton Daisy, the Spider Plant is very low maintenance and not really known for its blooms—small, clustered white flowers with a very short lifespan. Instead, what makes the plant memorable are the green and white striped and ribbon-like leave; although some varieties do have all-green leaves. Unlike others on this list, Moth Orchids aren’t just one very specific kind of plant; Phalaenopsis is a genus, under which fall dozens of species—native to parts of Asia and Australia—as well as numerous artificial hybrids. Moth Orchids are known for long-lasting blooms, with flowers lasting from two months to half a year before dropping; mature plants can also blooms more than twice a year. With the number of individual species and hybrids, the flowers can be just about any color; from pure white to candy and jewel color tones. They’re quite popular as a house plant due to this reputation, as well as the fact that they’re the easiest orchids to maintain and cultivate—though compared to other house plants, they’re not low maintenance by any means. Moth Orchids are not for people without a green thumb! 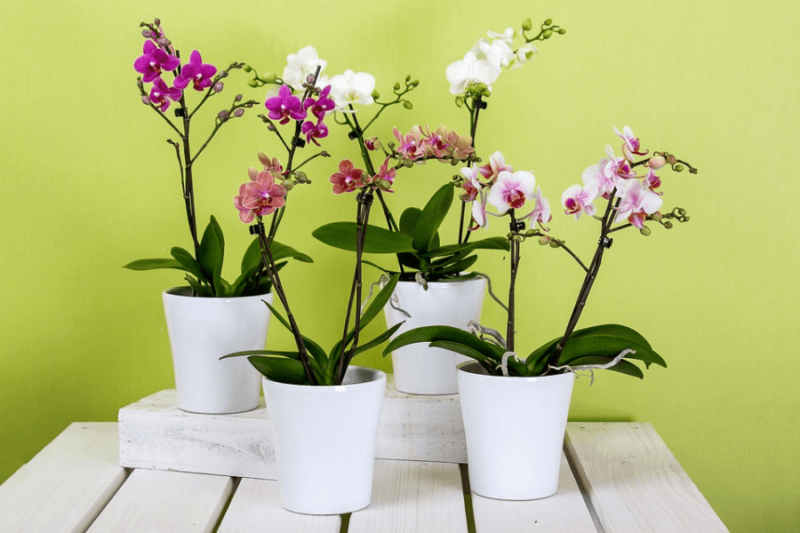 Although Moth Orchids thrive in indirect light and typical indoor humidity and temperature, great care should be taken in making sure that they’re watered, fertilized and re-potted properly.